Steed remarks at Rhonda's silence, so Mother calls her over and asks her to say hello to Steed. The bizarre voice Steed hears is actually Mother practicing ventriloquism! Mother spends his birthday with two of his aunts, and entertains them with a tale of "The Great Great Britain Crime," wherein the Intercrime organization prepares to rob all of Britain's treasures in one fell swoop by staging a false alarm missile attack on London. Major portions of an unaired episode entitled "The Great Great Britain Crime," produced by John Bryce in December 1967, along with bits and pieces of footage from a few Emma Peel episodes, were combined with newer framing material featuring Mother. The result? A train wreck. Possibly the worst (original) Avengers episode in existence, surpassing "Bizarre" and even "Invasion of the Earthmen." As Mother relates his "tall tale" to his aunties, it begins with two opening fight scenes	borrowed from "The Bird Who Knew Too Much," followed by	brief clips from "Murdersville" and "The Fear Merchants." 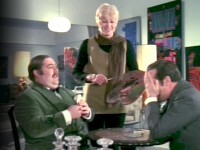 Later, the battle between Steed and Professor Stone from "Never, Never Say Die" is inexplicably injected. Perhaps these non-sequiturs were meant to underscore the fictional quality of Mother's story—or maybe they were attempts to spice up Bryce's bland material. Speaking of which, seeing the leftovers of his efforts provides some clues as to why he was sacked only a month or so into the job: dreary pacing, bad acting (especially the American! ), and absolutely no spark. Dressing it up with the birthday setting only made matters worse, as these scenes are played so broadly that they clash terribly with Bryce's "realistic" style. In the end, nothing can help. It should have been left in the dustbin. 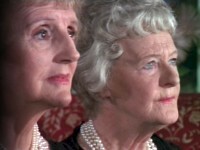 The tag scene with Steed, Mother and Rhonda,	set in Mother's place, is most unusual in that it does not feature Tara, making it the only tag of its kind. Also unique is the music over the closing titles which, for no apparent reason, begins with that of Izzy Pound and His Incredible Marching Sound from "The Interrogators," then segues to a version of the Avengers theme done with piano and orchestra. Guest actor Gerald Harper (Colonel Corf) starred as Steed's counterpart in the quasi-Avengers-ripoff Adam Adamant Lives. Car park scenes filmed in Watford.